The World’s End is the third installment in the Cornetto Trilogy by writing duo Edgar Wright and Simon Pegg. 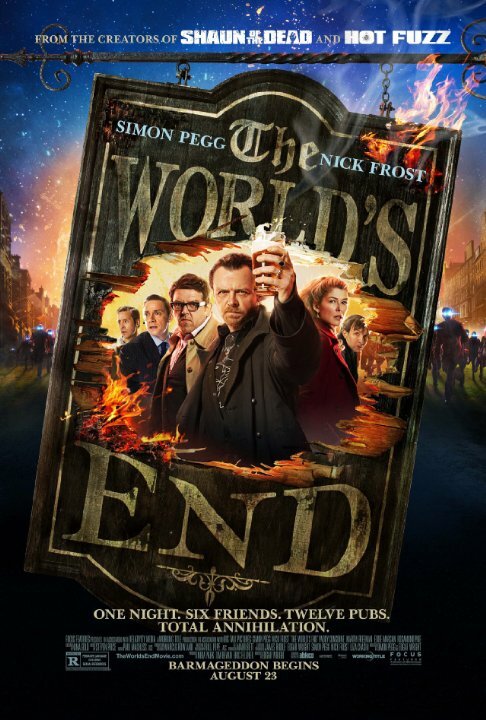 Building upon the same formula of their previous successes (Shaun of the Dead & Hot Fuzz) The World’s End adequately delivers laughs and embraces Wright and Pegg’s writing talents. “The Golden Mile” involved going around and drinking a pint of beer at each of 12 pubs in the characters hometown of Newton Haven. Shortly after starting the quest, Gary gets into a fight with an odd acting teenager in a bar bathroom. Gary knocks the teen against the wall causing his head to fall off and exposing him as a robot. The chaos starts to ensue shortly afterwards when Gary and his friends notice that the whole town of Newton Haven is infested with human-looking robots filled with blue ink. Characterization is great in the film. Simon Pegg successfully play a drunk and druggie who is looking to have a good time with friends. Nick Frost (Pegg’s partner in crime in Shaun of the Dead) pulls off a solid performance as the reserved one of the group. Martin Freeman from the movie The Hobbit is also in the film. Enjoyment will come from watching the film if the viewer liked the first two films in the Cornetto Trilogy. Crazy antics and surprisingly cool action scenes help keep the viewer watching. A sign of relieve can be given for the fact that the film does not employee the standard apocalypse movie format of people just running around and screaming. Whether you have a love of sci-fi, action, or comedy, The World’s End employees all three while still giving new things to laugh at. The World’s End is a slapstick comedy that gives more to love from the creative minds of Pegg and Wright.